When the Russian Navy and FSB attacked a small flotilla of the Ukrainian Navy consisting of the Yani Kapu tugboat and the small armoured boats Berdyansk and Nikopol in the Kerch Strait on 25 November, the Russian Federation once again showed its true face to the international community. Whereas earlier the Kremlin used to say something simple about its aggressive actions against Ukraine, such "it's not us", "they are not there", "we have nothing to do with it", in this situation it openly showed the international community its disregard of international law by carrying out a direct act of aggression. As a result, the Russian forces' illegal actions with regard to the ships and personnel of the Ukrainian Navy bring relations between the countries to a new level. 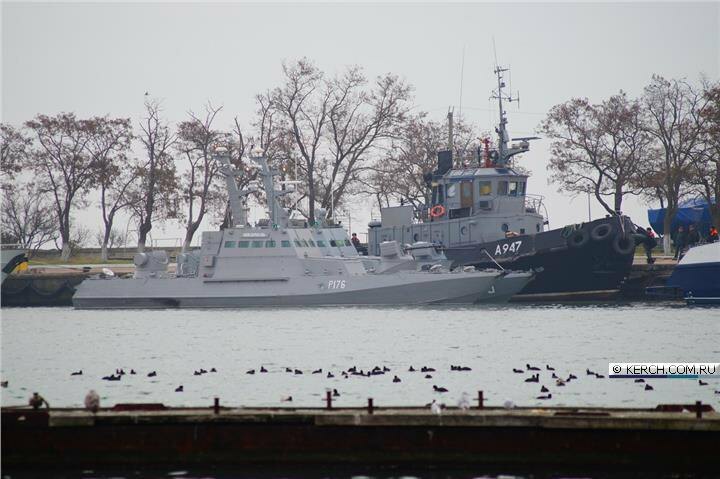 On 25 November, a Ukrainian boat team was sailing from the port of Odesa to the port of Mariupol. In accordance with the 2003 Ukrainian-Russian treaty on cooperation in the use of the Sea of Azov and the Kerch Strait, the naval boats could freely cross the Kerch Strait and enter the Sea of Azov. 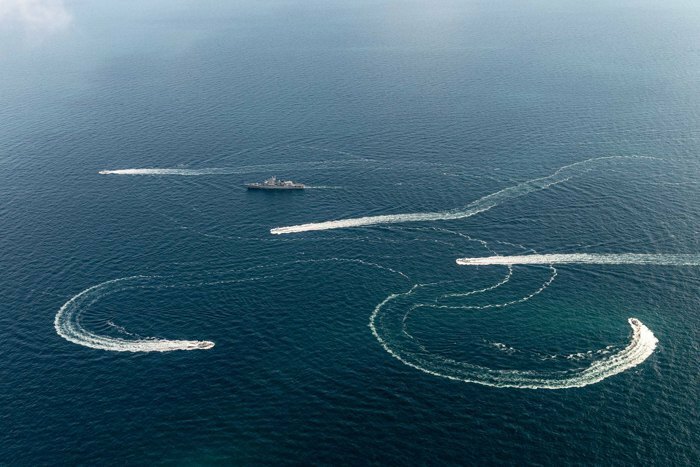 At the same time, according to the Ukrainian Navy and radio exchange files, Ukraine warned about the passage of its ships to the Sea of Azov. That is, the Ukrainian side de facto acted the same way it did during the September journey of the Donbas and Korets ships. However, this time Russia ignored the notification and deliberately chose to escalate tension in the region. At first, the flotilla was banned from moving in the direction of the Sea of Azov. 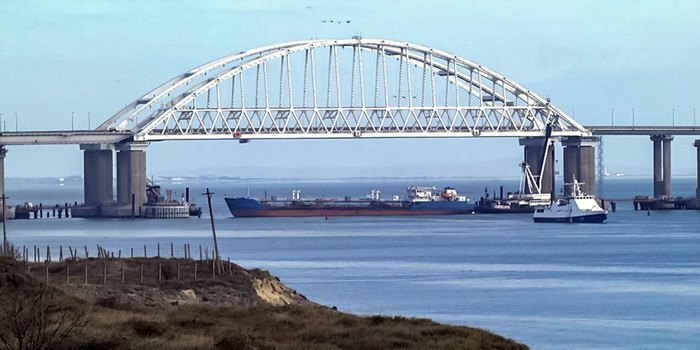 Then its passage was physically blocked by a ship placed across the fairway under the arch of the Kerch Bridge, which made it impossible to continue movement. At the same time, Russia publicly said that the ship ran aground in the strait, having completely blocked the navigation. As a result, several dozen civilian vessels, both in the Azov and Black Seas, which wanted to cross the strait, formed a huge jam. In the morning, the Russians attempted to squeeze out the flotilla out of the Kerch Strait by means of attempted collisions (up to nine). The FSB border service ship Don even rammed the Ukrainian tugboat Yani Kapu, damaging its main engine, sheathing and open railing and sending its life float to the sea. The Russians clearly tried to provoke the Ukrainian boats to respond. However, this did not happen. When, considering the escalation of the situation, the Ukrainian boats decided to return to Odesa, the overwhelming Russian forces made of boats (coast guard cutters of the Sobol type, the coast guard boat Don, Mangust-type boats, the small coast guard boat Suzdalets, etc.) and aviation tried to prevent this by carrying out dangerous manoeuvres and illegally demanding that the boats stop. Finally, they began to threaten the use of force, and after the Ukrainian flotilla entered neutral waters (that is, outside the 12-mile zone), the FSB ships opened artillery fire to kill. The Berdyansk gunboat was damaged by artillery fire and lost speed, some of its crew members were injured (according to various estimates, up to 6 people, including two seriously wounded people). Soon the Russian special forces landed on board and seized this boat and the Yani Kapu tug. Nikopol tried to avoid the capture and continued to manoeuvre, trying to leave the area of the engagement on its own. Later, both gunboats and the tug were towed to the port of Kerch. 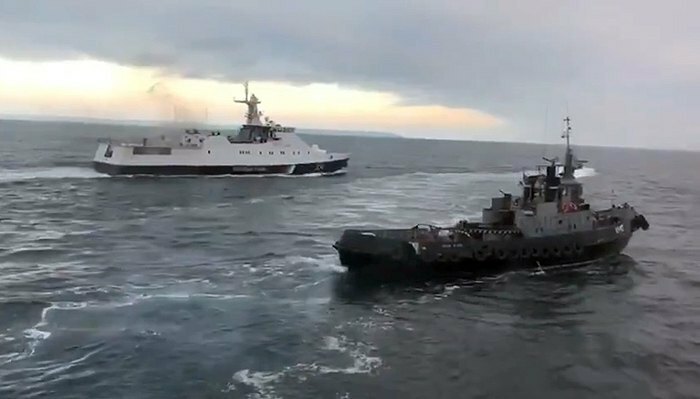 The Russian FSB said its aggressive actions were in response to an alleged violation of the Russian state border by the Ukrainian ships. In particular, this is what was said in a statement issued by the illegal "border department of the Russian FSB in Crimea". Obviously, it is a made-up reason which has nothing to do with reality since the authoritarian authorities of the Russian Federation planned this act of provocation well in advance, right after Ukraine's Donbass control ship, accompanied by a tugboat, successfully crossed the Kerch Strait in September. Apparently, that passage hurt the Russian ego too much. By committing these actions, the Russian Federation openly violated international regulations on navigation in the Black Sea. These are the 1982 UN Convention on the Law of the Sea, the UN Charter, UN General Assembly Resolution 3314 (XXIX)1974, and the 2003 Treaty between Ukraine and Russia on cooperation in the use of the Sea of Azov and the Kerch Strait, which regulates the use of these two water areas. In particular, Article 17 of the 1982 UN Convention says vessels of all states, both coastal and those that do not have access to the sea, enjoy the right of "peaceful passage through the territorial sea" if they honour the Convention. According to Aarticle 24 of the same convention, a coastal state "should not prevent a peaceful passage of foreign vessels across the territorial sea". Part 1 of Article 36 of the same document says that in the straits referred to in Article 37 of the UN Convention, all ships and aircraft enjoy the right of transit passage, which should not be obstructed. Further, according to clause 1 of Article 2 of the 2003 Treaty, "commercial and military ships... flying the flag of Ukraine or Russia... enjoy free navigation in the Sea of Azov and the Kerch Strait". In practice, this means that Ukraine did not even have to notify Russia about anything because it acted in accordance with the above-mentioned regulations. What is more, it is worth reminding the Russian Federation that Crimea is an occupied territory and not only in Ukraine's opinion. Therefore, any allegations about Russia's territorial waters in Crimea are illegitimate. Well, the collision with, ramming, shelling of a warship, which is a sovereign territory of the state, and its further capture, in fact, constitute an act of direct aggression as defined by the UN General Assembly Resolution No 3314 (XXIX) of 1974, "the use of armed force by a state against the sovereignty, territorial integrity or political independence of another state". Certainly, Ukraine must react accordingly to the Russian actions against its ships. So, the war cabinet convened, followed by the night meeting of the National Security and Defence Council of Ukraine. 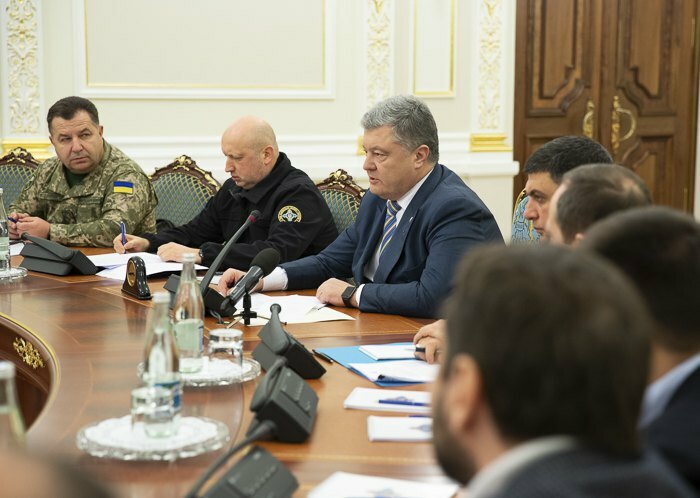 As a result, President Petro Poroshenko suggested that parliament should consider introducing martial law for 60 days at an extraordinary meeting on Monday, 26 November. It can be predicted that in the future, Ukraine is likely to denounce the Treaty between Ukraine and the Russian Federation on the use of the Sea of Azov and the Kerch Strait. After all, according to it, the Sea of Azov was recognized an inland sea between the two states, where international maritime law, in fact, did not apply, and Ukraine could not feel at ease even in the 12-mile zone of its territorial waters. The latest aggressive actions of the Russian Federation are prompting Ukraine to denounce this treaty since the Kremlin simply does not honour it. An active military confrontation between Ukraine and the Russian Federation at sea is hardly possible in the current situation because Ukraine lacks capabilities and resources. Therefore, Kyiv will use all possible international platforms to put pressure on the Russian Federation - the UN, the OSCE, the EU, etc. Generally speaking, this has already been happening today. The UN Security Council will hold a meeting to discuss Russia's illegal actions in relation to the Ukrainian warships. In addition, Ukraine initiated an emergency meeting of the OSCE Permanent Council and began negotiations with G7 leaders and other partners of Ukraine. Also, President Petro Poroshenko had a telephone conversation with NATO Secretary General Jens Stoltenberg who agreed to urgently convene an emergency meeting of the Ukraine-NATO commission on the same issue. Although the Ukrainian Armed Forces have been put on high alert in response to the Russian actions, there is no intention to attack anyone. This is done to protect the sovereignty and territorial integrity of the state only. In fact, Ukraine is demonstrating readiness for decisive action, however, it certainly inclines to use political and diplomatic tools. What happened in the Kerch Strait will definitely not go unnoticed. After all, the Russian actions carry a threat of a full-scale military conflict and endanger the security of states in the entire Black Sea region. After all, this is all a continuation of Moscow's policy to secure full control over the Sea of Azov. 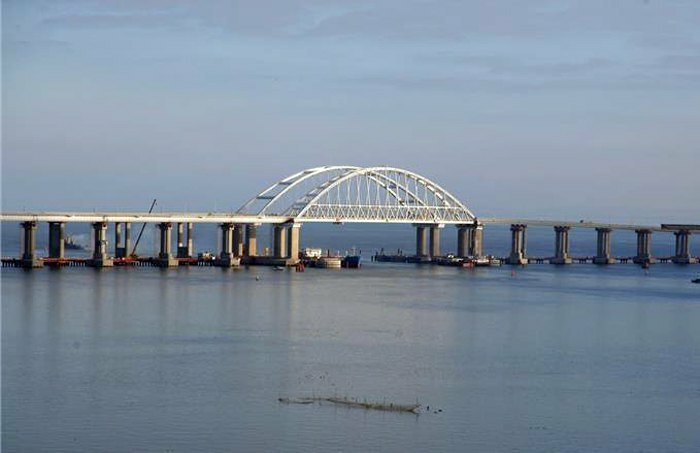 Russia first flagrantly violated the international maritime law and the UN Convention on the High Seas by building the Kerch Bridge, causing Ukraine to lose millions of hryvnyas and jobs in the Ukrainian ports in Mariupol and Berdyansk. Russia then started stopping merchant ships crossing the Kerch Straits for checks and not for 3-5 hours, as the Russian Foreign Ministry says, but for several days, sometimes weeks. And this time, by firing on and seizing the Ukrainian vessels, Moscow has actually closed the Kerch Strait for Ukraine. If the world community does not respond to the Kremlin's actions in the Sea of Azov, Russia will continue its policy of blocking Ukraine in the Black Sea, which means that NATO should expect an escalation of tension on its eastern flank. In fact, the Kremlin has been deliberately and systematically destabilizing the situation in the region, continuing attempts to destroy the existing security architecture. If the international community does not respond now to the Russian actions by stepping up sanctions and truly ignoring the Kremlin at the international level, the situation will only get worse. Ukraine cannot resist such a strong opponent on its own, so the help and unity of the international community are as appropriate as never before. One of the further options could be an expansion of the OSCE SMM’s mandate to the Sea of Azov. Joint patrolling of this territory can bring down the existing degree of tension and prevent further escalation. The denunciation of the Treaty between Ukraine and the Russian Federation on the use of the Sea of Azov and the Kerch Strait will allow us to establish a 12-mile zone and fully control it, while it will also be possible to re-regulate the use of the Kerch Strait and neutral waters in the Sea of Azov in line with the international maritime law. Yani Kapu boat commander: "We were waiting for pilot when they attacked us"